Home / Health / Herbs / Unexpected Benefits of Drinking Tea. Unexpected Benefits of Drinking Tea. Not only consumed in cold conditions like in some places to eat, but tea is also often enjoyed in warm conditions. One of the benefits of enjoying tea is to make our mind calmer and we are free from stress. However, do you know if it turns out that tea has so much good for our bodies? 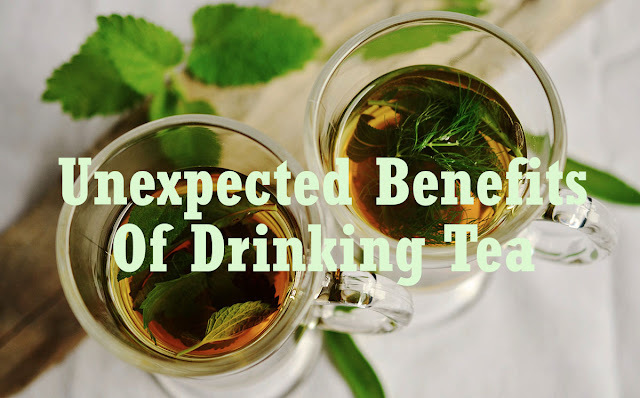 There are many unexpected benefits of drinking tea. Tea is the result of processing tea leaves used as a beverage. Good tea is produced from the shoots plus 2-3 young leaves, the young leaves contain polyphenols, caffeine, and amino acids. These compounds that affect the color, aroma, and taste of tea. The content of the compounds contained in tea leaves also has health benefits. By drinking tea regularly will increase the level of memory, cognitive performance, feeling of pleasure and mood. Benefits of tea for health. Reducing the risk of cancer. Based on the results of research from the University of Parma, Italy, it is known that men who regularly enjoy green tea will tend to have a much smaller risk of prostate cancer. In fact, another study from China says that the consumption of green tea every day can reduce the risk of lung cancer and also various other types of cancer significantly. Health experts say if we consume black tea at least three cups or more each day, then we will reduce the risk of type 2 diabetes significantly. For diabetics, regular consumption of black tea will also make the body better in maintaining blood sugar balance. This fact is obtained from the results of research conducted by Framingham State University which states that the antioxidant content of black tea can block various enzymes that increase blood sugar levels. The results of the study were published in the journal American Chemical Society's Journal of Agricultural & Food Chemistry, saying that if the antioxidant content of catechins in green tea would prevent glaucoma in the eye. The results of other studies conducted at the University of Scranton also said that if you regularly drink tea will reduce the risk of developing cataracts. The Journal of the American Journal of Clinical Nutrition states that if the antioxidant content in a tea called flavonoids will help bones stay solid and strong. Health experts also recommend that we drink at least three cups of black tea a day so that our bones remain strong until old age. Cardiovascular disease is related to blood lipid levels and blood pressure. Several studies have shown that tea has the effect of reducing the risk of cardiovascular disease by reducing the level of pressure. Also, read 12 Benefits Of Cinnamon For Health.